Biodiversity generally refers to species richness (i.e. number of species), but other definitions are also common. It is critical that biodiversity is defined carefully as it is sometimes considered synonymous with genetic diversity, habitat diversity, structural diversity, the diversity of functional groups (e.g. trophic groups of life history stages) or even life history traits (e.g. feeding type, growth forms, reproductive strategy, longevity). Some definitions can be a proxy for species richness. For example, species representation and abundance are known to vary among habitats. Habitat richness, therefore, can be especially relevant where the taxonomy of organisms in the various habitats is poorly known and there are concerns to protect species richness. A critical component of the zoning plan of the GBR (the Representative Areas Program, see Chapter 12) was partly based on the protection of different habitats and used these as surrogates to conserve species diversity as the biota on the GBR is poorly known apart from the corals and fish. In this chapter we focus on patterns of species richness at different spatial and temporal scales. We also note that descriptions of biodiversity and an understanding of processes influencing biodiversity (e.g. the impact of human activities) are critical for ecosystem management. Coral reefs occur in a broad band around the equator, wherever suitable depths occur, between latitudes of 30°N and 30°S, see Chapter 7, although some coral reef development occurs further south and north where water currents ensure that for most of the year water temperatures do not drop below 18°C. For example, the gyre from the East Australian Current diverges eastwards south of the GBR and enables coral reefs to be developed on the east coast of Lord Howe Island at 31°30'S. This is the southernmost coral reef in the world. Species richness varies at scales that range from ocean basins and seas to habitats on reefs (Box 13.1 and Box 13.2). The richest reefs in the world in terms of number of species occur in the triangle that includes the northern tip of the Philippines and eastern and western tips of Indonesia, although today many of these reefs have been damaged by human activities, including dynamite fishing, overfishing and coastal developments. An illustration of this diversity is the recent intensive survey of all the coral reef environments within an area of 295 km2 in New Caledonia, which resulted in the collection of over 2700 species of molluscs. This is much larger than the number of species recorded from similar areas anywhere else in the world. Of these molluscs 32% were found only at one site and 20% of species were only represented by a single individual, indicating that rare species make up a considerable proportion of the fauna. In addition, many of the species were unde-scribed. In the entire Indo-Pacific, in the well known group of opisthobranchs (nudibranchs) it is estimated that at least 30% remain to be formally described. In other invertebrate groups much of the fauna remains even to be collected, let alone formally described. Many factors are responsible for the high diversity of biota found on coral reefs but in part it is due to the diversity of habitats found within coral reefs—ranging from soft sediments (both vegetated and unvegetated), various reefal habitats, and pelagic and coastal habitats that include mangroves and salt marsh. Habitats are usually characterised by particular habitat-forming organisms and variation in geomorphology. For example, Isopora cylindrica is a habitat-forming coral with spur and groove geomorphology, creating a shallow habitat (see Chapter 5). Species richness is generally measured as number of species per unit area. Richness will, of course, increase with area and decisions have to be made on sample unit sizes that give estimates of diversity with a level of accuracy that suits the question being asked; particularly large areas are required for rare taxa. Species richness does not consider the proportion of each species in the assemblage, or the 'evenness' of representation. Measures of evenness are an attempt to measure dominance of a few species in a sample unit. Where one or a few species are very abundant when compared to the total number of species in the sample, then evenness is low. Heterogeneity of an assemblage is a combination of species richness and the evenness of species representation. Heterogeneity indices (including, logarithmic series and log normal distributions as well as nonparametric measures such as Simpson's index, the Shannon-Wiener function and the Brillouin Index) have often been used to measure diversity. Krebs recommends the following when measuring biodiversity: (1) construct Whittaker plots of log abundance v. species rank; (2) where sampling effort varies spatially use the 'rarefaction method' for estimating the number of species expected in a random sample of individuals taken from a collection (this will give valid comparisons of richness among assemblages); (3) explore the use of log series and lognormal curves where variation in patterns are shown in the Whittaker plots; (4) use an inverse Simpson's Index of the exponential form of the Shannon-Wiener function to describe heterogeneity. Depending on your hypothesis you may want to weight common species (Simpson's) or rare species more (Shannon's) in the analysis. The latter decision is also critical in complex analyses of assemblage composition such as Multi Dimensional Scaling (MDS) (described by Clark and Warwick) and complementary tests such as analyses of similarity and dissimilarity among samples. Some studies use 'indicator species' as a measure of change in an assemblage, but the robust use of indicators needs to be tested carefully. described, with several major biogeographic patterns observed (Fig. 13.2). First, there is a distinct separation between Atlantic and Indo-Pacific fauna. Some species are widespread throughout the Indo-Pacific, but there is a distinctive Indian and Pacific fauna and components of this fauna extend into the Indo-Australian arc. Endemicity occurs in a number of areas including even the relatively young areas of the Red Sea and Arabian Gulf. Some of these patterns can be explained by looking at the fossil record of this group as well as the geological history of the area (see Chapter 20). Other studies are required on other invertebrate groups to see if this pattern is a universal one, but such groups need to be speci-ose, well known taxonomically, possess a fossil record and have detailed distribution records, which does somewhat limit the choice of taxa. Biogeographic patterns of diversity that are similar to corals can be found among other well known groups such as fish, echinoderms, molluscs and some decapod crustaceans. For example, the distribution of species of damselfish across the south Pacific (Fig. 13.3) also clearly shows a reduction in the number of species from 110 in the coral reef triangle, slowly declining across the Pacific until members of the family are no longer found. Patterns of species representation are odd for some groups. For example, some tropical taxa have 'antitropical' distributions, in which they are found on the GBR and at high latitude reefs near Japan (e.g. Labridae, Bodianus perdito). Group whereas over 1500 species have been found in the Lizard Island area. While diversity of habitats may explain some of this increase, warmer sea temperatures play a potentially important role. Certainly some species occur throughout the GBR whereas others are restricted to more northern regions. For example, the leopard coral trout (Plectropomus leopardus) and Chinese footballer (Plectropomus laevis) are found throughout the GBR whereas the square tail grouper, Plectropomus areolatus, is only found north of about 11°S (near Lizard Island). In addition to latitudinal changes, the variation in diversity at spatial scales of tens to hundreds of kilometres is often greater across the shelf than with latitude. This has been well documented for fish on the GBR. Comparisons of fish faunas of inshore reefs, with those on reefs in the GBR lagoon and with those on the outer barrier reveals significant differences both in the terms of abundance and species present (Fig. 13.4). Those of the inshore reefs that are subject to strong terrigenous influences are distinctively different to those on the mid and outer continental reefs. Inshore reefs tend to be depauperate in terms of species diversity compared to offshore reefs. These differences are apparent across each of the zones of these reefal systems, for example the fish communities of the outer reef slope differ depending where that outer reef slope is located. While the initial studies to document this cross diversity were carried out in the Townsville region, subsequent studies in other parts of the GBR confirmed that this is a widespread phenomenon. 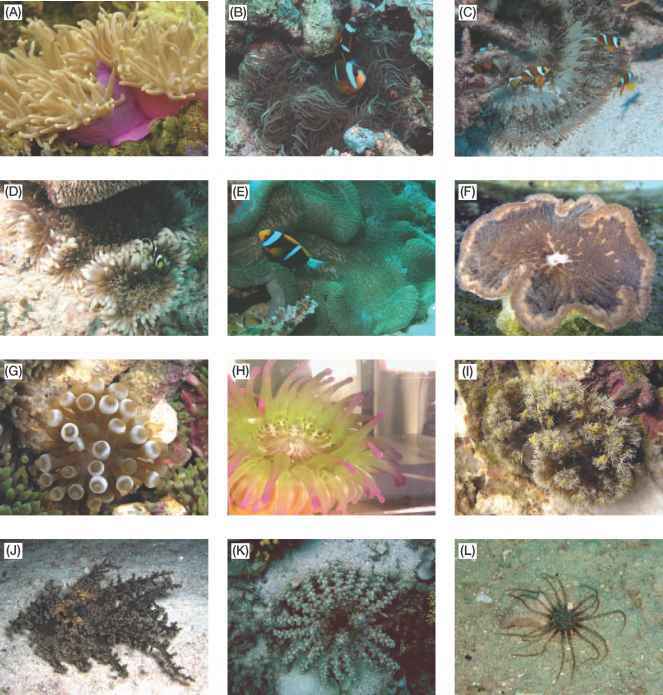 The complexity of habitats within each reefal system can easily mask this cross shelf variation; it was only when the distribution of species within a reef was carefully documented against habitat that these patterns became obvious. In the case of herbivorous fish, their distributions are related to the ways in which they feed. with most species having well defined habitat requirements in terms of depth, water clarity and water movement. In the following chapters, most authors have given some idea of the diversity of each group where known. As will become clear, however, many of the specialists in the following chapters could only give partial estimates of the diversity of their groups because much of the diversity is currently undescribed. Even less is known about their distributional patterns along the GBR. This was recently highlighted by the seabed biodiversity project (Chapter 6). In general, our knowledge tends to decline with decreasing size of the organism, with the meiofauna inhabiting the soft sediments most poorly known, along with the permanent members of the plankton. In summary, it seems likely that for most invertebrate groups the number of species is higher in the northern GBR than in the southern, and distinct distribution patterns occur across the shelf as well as within a reef depending on levels of exposure, depth and water clarity. As many of the invertebrates and many fish species recruit by pelagic larvae, larval recruitment is a critical factor in determining adult populations. Events that modify the supply of larval recruits may have significant impacts on successful recruitment many kilometres away. As discussed in earlier chapters, coral reefs are dynamic environments and anthropogenic impacts are increasingly influencing patterns of biogeog-raphy on the GBR. With climate change we may expect to see species distributions extending further south into cooler waters, providing suitable habitats exist. Key processes that need to be understood include: specia-tion, endemism, coexistence, extinction, the vulnerability of taxa and the habitats in which they live as well as biological and physical stressors affecting biodiversity that vary in space and time. Clarke, K. R., and Warwick, R. M. (1999). The taxonomic distinctness measure of biodiversity: weighting of step lengths between hierarchical levels. Marine Ecology Progress Series 184, 21-29. Folke, C., Carpenter, S., Walker, B., Scheffer, M., Elmqvist, T., Gunderson, L., and Holling, C. S. (2004). Regime shifts, resilience and biodiversity in ecosystem management. Annual Review of Ecology, Evolution and Systematics 35,557-581. Frid, C. L. J., Paramor, O. A. L., and Scott, C. L. (2006). Ecosystem-based management of fisheries: is science limiting? ICES Journal of Marine Science 63, 1567-1572. Singh, J. S. (2002). The biodiversity crisis: a multifac-eted review. Current Science 82(6), 638-647. Bellwood, D. R., and Hughes, T. P. (2001). Regional-scale assembly rules and biodiversity of coral reefs. Science 292, 1532-1534. Bustos-Baez, S., and Frid, C. L. J. (2003). Using indicator species to assess the state of macrobenthic communities. Hydrobiologia 496(1-3), 299-309. Bellwood, D. R., Hughes, T. P., Folke, C., and Nystrom, M. (2004). Confronting the coral crisis. Nature 429, 827-833. Coleman, F. C., and Willliams, S. L. (2002). Overex-ploitating marine ecosystem engineers: potential consequences for biodiversity. Trends in Ecology and Evolution 17(1), 40-44. See web site for an extended list, with updates: http:// www.australiancoralreefsociety.org/ [Verified 22 February 2008].